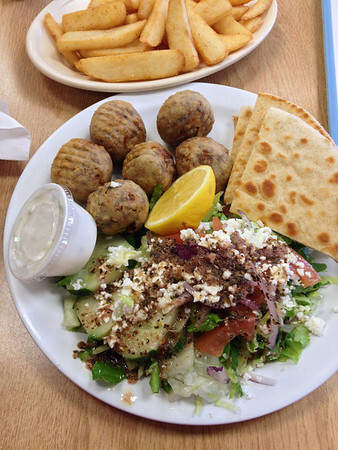 A friend of mine once asked me to join him for some Greek food. There were several places in the neighborhood, but I was not surprised when he pulled up in front of a little gas station located on Richmond, near the Galleria area in Houston. He’s that kind of adventurous. Ekko’s is a little blue and white station, in an area that boasts not only Smoothie King and Chipotle, but also very upscale places featuring $50 steaks and $100 stone crabs. It’s less than a mile from consulates, internationally known law firms, and the Galleria shopping center, anchored by Neiman Marcus. At the back of the attached convenience store is a long counter manned by a group of food lovers. A huge menu dominates the space above the wall of coolers on one side. On the other side, there are a few small tables. 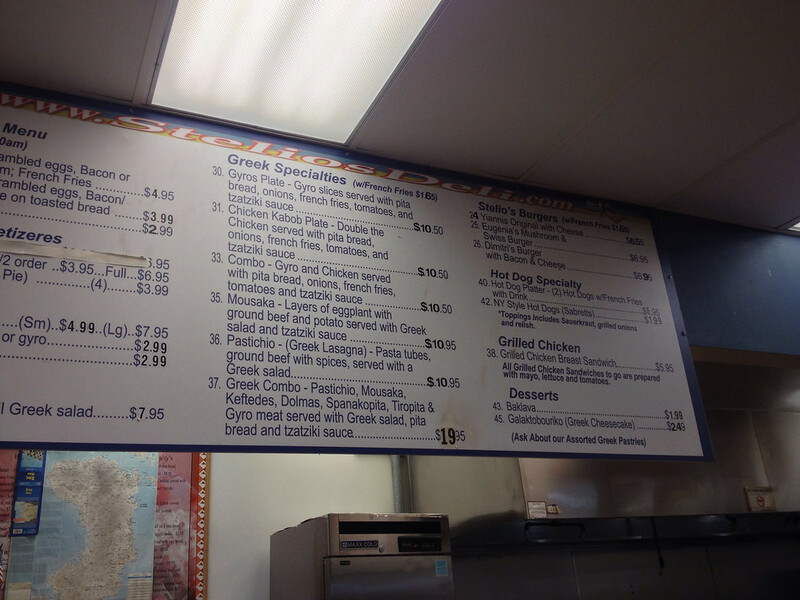 When I first visited the place several years ago, the deli was called Stelio’s, but on my trip last weekend, I found that they had changed the name to Ekko’s Greek American Deli. They do a brisk take-out business at lunch and after work. I was there during off-hours on a Saturday, and had the small dining area to myself, although I watched a steady stream of people come in and pick up their call-in orders. Even in this tiny place, if you eat in, the food is on actual plates with metal forks, not Styrofoam take-out containers. This was the snack I ordered. Sadly, most of it I left behind. Not being especially hungry, I thought I’d get a ‘light’ lunch of a few keftedes. HA! I was served a skewer, plus salad, warm pita, and a pile of perfectly salted fries that heaped over the side of the plate. No way I can eat this much, but I enjoyed the meatballs and a few bites of the fries, and watched the people wander in and out of the store, paying for their gas, picking up drinks or a bag of chips, and coming in to visit the deli in the back. The gas station entrepreneurs are taking the little shop to the next level, opening some delis in a bit more comfortable locations, such as the Medical Center (which needs some better quality ‘fast’ food, badly), and other locations around central Houston. A very ordinary gas station store, with a menu hanging over the beer coolers. It’s very unlikely that any of you will have an opportunity to be near this place. 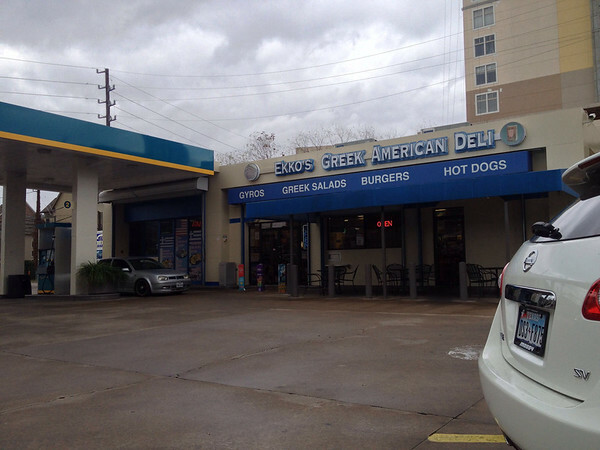 If you’re on a quick trip to Houston for business or pleasure, “gas station Greek” is not high on your list. However, keep in mind that quite often some of the best food can be found in little places where you least expect. Hummus: What you dont know now you know! I assume the glands aren’t frozen?